While snowed-in at the Wickford Castle Ski Resort you, as Nancy Drew, are trapped in a place that's as strange as its history. The castle is a riddle, full of dead-ends and detours that hint at a legend left behind by Marie Antoinette! Solve baffling puzzles, search concealed rooms, interview evasive suspects, and sidestep danger on the hunt for a secret that the doomed Queen was desperate to hide. 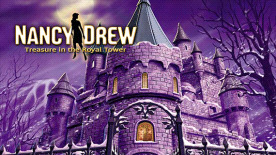 Nancy Drew®: Treasure in the Royal Tower is a first-person perspective, point-and-click adventure game. The player is Nancy Drew and has to solve a mystery. Explore rich environments for clues, interrogate suspects, and solve puzzles and mini-games.